I tried to ignore it but when I checked my FB Android app this afternoon, I saw this Facebook Graphic App Hoax status notifications are invading my FB news feeds, with lots of DONE, Done and done comments from their friends!!! 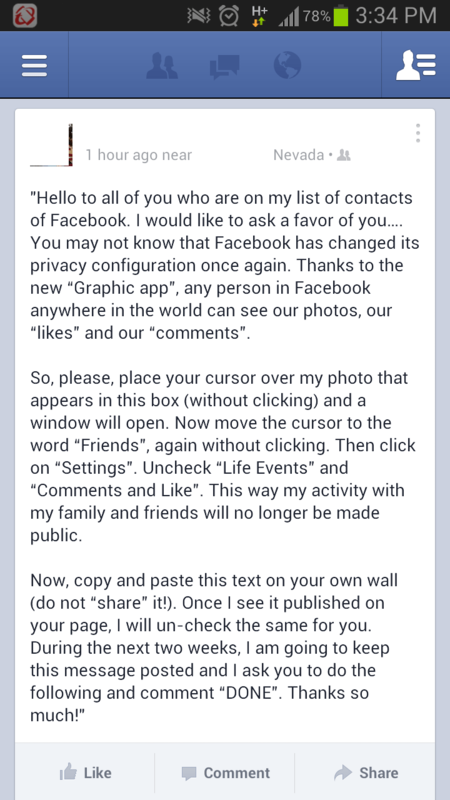 Facebook Hoax + “Privacy”-sensitive FB friends = FTW! I said enough is enough, this hoax needs some clarification in menardconnect.com before it gets out of hand because the hoax seems to be attempting to do some Facebook “privacy scare” but in reality it just provides misleading information. Honestly, this one seems to be a recycled hoax from last year. I saw the same steps in the previous “I Want to Stay Privately Connected with You” scare messages in Facebook in 2012, but this time, it uses the Graphic App (whatever that app is) as a legit term bait. I will not comment on the privacy concerns about FB Graphs Search function, I will leave that to other security and tech blogs to discuss in detail. There is no such thing such as the Graphic App described in the Graphic App Privacy Warning Hoax (see text sample below). Do _NOT_ confuse that Graphic App with the Graphs Search function of FB. They are _NOT_ the same. 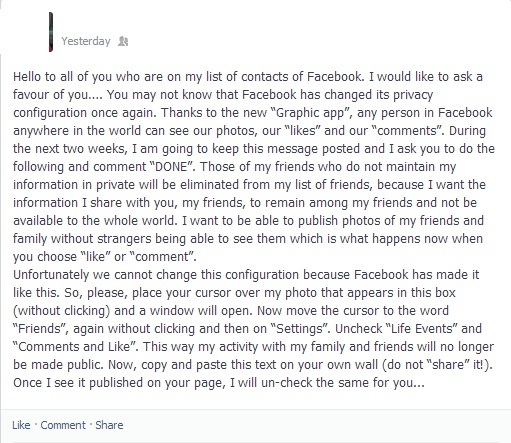 Actually if Facebook users follow the instructions in the second paragraph, it will _NOT_ change any privacy settings. It will just control which updates will be shown for that friend. Meaning you won’t see any “Life Events” and “Comments and Like” from that friend anymore. Please DO NOT Copy and Paste the hoax in your status. Nothing serious will happen, but honestly it’s a waste of your time and you are just spreading misleading information and you are just adding to the Facebook clutter problem. Hello to all of you who are on my list of contacts of Facebook. I would like to ask a favor of you…. You may not know that Facebook has changed its privacy configuration once again. Thanks to the new “Graphic app”, any person in Facebook anywhere in the world can see our photos, our “likes” and our “comments”. So, please, place your cursor over my photo that appears in this box (without clicking) and a window will open. Now move the cursor to the word “Friends”, again without clicking. Then click on “Settings”. Uncheck “Life Events” and “Comments and Like”. This way my activity with my family and friends will no longer be made public. Now, copy and paste this text on your own wall (do not “share” it!). Once I see it published on your page, I will un-check the same for you. During the next two weeks, I am going to keep this message posted and I ask you to do the following and comment “DONE”. Thanks so much! Again, I would like to request that you DO NOT Copy and Paste the hoax warning in your status. 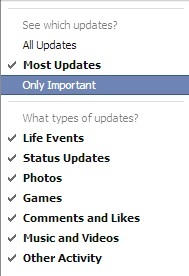 You are just spreading misleading information and you are just adding to the Facebook clutter problem. Be part of the solution and not part of the problem OK? I will try to find other Facebook Hoaxes for 2013 and feature it here in menardconnect.com. If you like this post, feel free to like, repost, share in Facebook, or tweet the link! Thank you!